up-to-date marketing guide for anyone looking to promote their business. The CEO of a Dubai-headquartered, international marketing agency has launched an up-to-date marketing guide for anyone looking to promote their business. In challenging market conditions, business owners seeking to maximise profits while reducing costs are increasingly looking for ways to drive sales and leads, while building lasting, profitable relationships with customers. Enter Promoting Your Business 2019 – a concise guide that introduces the reader to key marketing concepts and provides insights and recent case studies useful for organisations of all sizes. Not a technical, academic textbook – this starter guide is packed with practical uses of both traditional tactics and current marketing technologies for those looking to take their new or existing business to the next level in terms of brand awareness and lead generation. It is also aimed at those working within a business looking to gain a better understanding of the most useful common marketing functions available. The information provided in the book also provides greater comprehension of the fundamentals of marketing and their application before investing in a consultant, agency or adding in-house resources to deliver these functions. Armed with this knowledge, business owners and executives can more confidently decide which marketing avenues to pursue and what human and financial capital is required to achieve their objectives. The book imparts the reader with the tools to drive brand awareness and lead generation for all types of businesses through integrated communications disciplines, including: PR, PR+, social media marketing, influencer marketing, online advertising, neo-SEO (modern search engine optimisation), content marketing and event marketing. 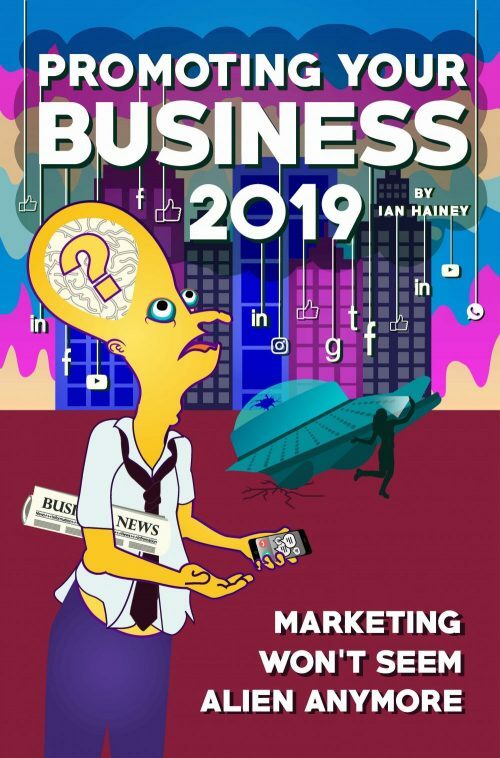 The author, Ian Hainey, spent the last year writing Promoting Your Business 2019 because of common situations in which he felt it was challenging to help people and businesses who would benefit from the services of an agency. He said: “This easy-to-read book will help many build a solid understanding of the fundamentals of promoting their business and understand the processes and background work that goes into marketing a company. It will aid owners of small businesses that cannot afford to pay for an agency and find promoting themselves daunting, so end up simply not doing it. “This is a well-written, highly informative go-to guide of the most relevant marketing tools for SMEs in today’s ever-evolving landscape. The author expertly cuts through industry jargon to give well balanced advice peppered with practical, relatable examples. Whether you’re considering investing in marketing for the first time, want to enhance you current business’ marketing, or even hiring a professional to step up your game, I would recommend you read this book” said Richard Thayne, international business manager, Capilano. “Having recently set up a branding business, reading this book has completely opened my eyes to the tools right there at my own fingertips to push on with marketing communications and has given me more confidence to try out some of the disciplines I wouldn’t have before reading it. It’s given me a thirst to learn more and would recommend it to any start-up,” said Ryan Spencer, iBrand You.